Borchert Field: Today in 1944 - "Sunshine, Big Crowd and a Victory for the Brewers"
Today in 1944 - "Sunshine, Big Crowd and a Victory for the Brewers"
On the afternoon of Wednesday, April 19, 1944, the Milwaukee Journal rushed this photo on to the front page of its late-afternoon edition. The following day, the paper carried a somewhat more complete look at the Opening Day festivities. Opening day! All streets lead to the ball park.... Curbs lined with cars for blocks around.... Buses dumping overflow loads.... "Keep moving, please!" ... "Use any entrance." ... "Gee, what a crowd! Do you think we'll get a seat?" ... "Get a cushion—nice S-O-O-FT cushion—the seats are hard" ... "Luggy number score cards, get a score card can't tell the players without nummers." ... And no numbers listed for the St. Paul players after you part with 10¢. "Peanuts! Peanuts!" ... What's a ball game without peanuts? You buy a sack and the first taste tells you these must be last year's peanuts.... "Let's see your ticket stubs - third box to the right." A half hour before the game and already the crowd is standing around the top of the grandstand.... "Nothing left but bleacher seats." ... Fans pour across the field to the bleachers. Kids climb the fence to beat more dignified grownups to the few remaining bleacher seats. A few fans mill around the outfield. The crowd there grows. Policemen herd the flock over into the far corners and groundskeepers appear to string ropes. Uniforms and flags and a band an endless speeches that nobody wants to hear. Some day will they learn to run these pregame ceremonies off with speed. Baseball is what this huge crowd has come to see.... At last! Mayor Bohn walks out to pitch the first ball. Catcher Pruett puts a cap on his head and somebody hands him a glove. Cameras click. The canny old mayor stops two-thirds of the way to the pitcher's mound and looks at home plate. Far enough for his right arm, he decides. The Brewers break from the bench and fan out to their positions. The mayor takes his stance. Cameras click. He throws! Good enough—he knew his strength, the ball makes it to Capt. Robert Rankin's mitt. "The first batter for St. Paul," boom the loud-speakers, "is Riskosky!" Up steps Riskosky. "Play ball!" yells the umpire. The baseball season is on! It was, indeed. Let's take a closer look at the photos in that series. 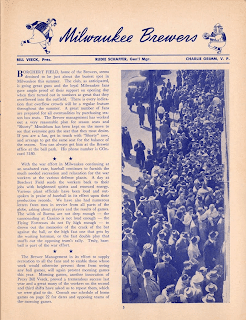 Milwaukee baseball fans turned out 13,694 strong for the Brewers' first game Wednesday afternoon. Long lines of buyers stood at the ticket windows right up to game time. Mayor Bohn threw the first pitch to Capt. Robert Rankin of the Marines. 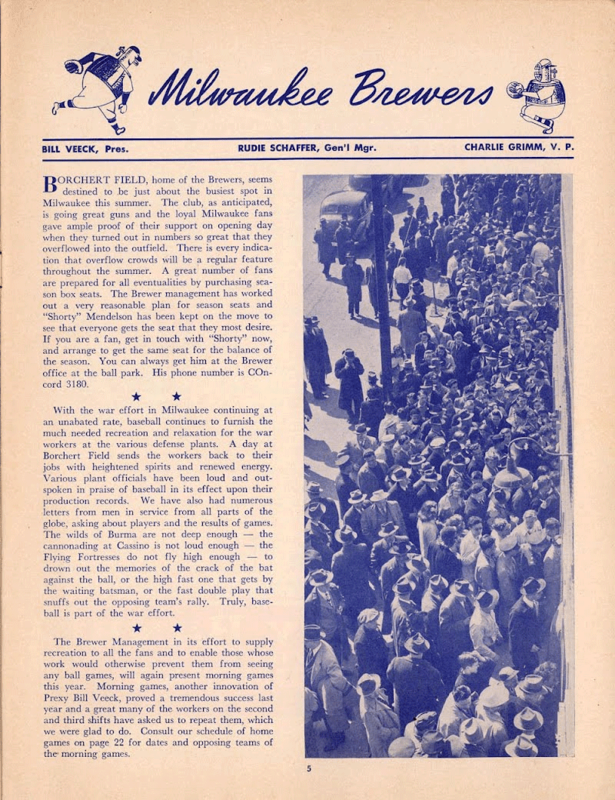 That same photo of the fans lining up to buy tickets for Opening Day was also published in the club's score cards later that season, giving us today a much better look than the low-res scan of the grainy Xerox copy of the newspaper page. Mayor John Bohn, throwing out the first pitch, had plenty to celebrate on that day. Just a few weeks earlier, on April 4th, Milwaukee voters elected him to his first full term as Mayor. Formerly the President of the Common Council, Bohn had been serving as acting mayor for two years, ever since Mayor Carl F. Ziedler had joined the Navy. It was the culmination of a long career in Milwaukee politics that had begun in 1898 with a four-year stint on the Milwaukee County Board of Supervisors. Bohn was elected to the Common Council in 1926 and served there until taking over the reins at City Hall in April 1942. 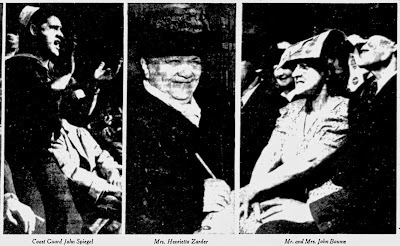 Mayor Ziedler's ship went missing off the coast of South Africa on October 11, 1942, and when Ziedler's term was up Bohn ran for his own term. He was 76 when elected, and served out his full term before retiring from politics. The "Capt. Robert Rankin" waiting to receive Hizzoner's ceremonial first pitch was the head of Marine Corps recruiting for Wisconsin and Upper Michigan. 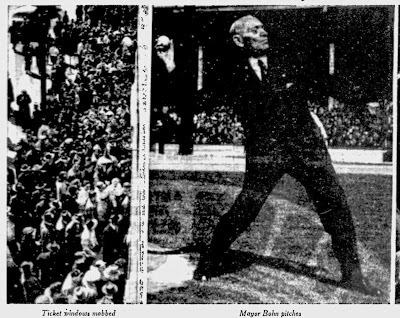 Speaking at the annual Elks' Club baseball dinner the night before, Captain Rankin had won over the crowd of 500-plus baseball fans with the line "I'm quite a talent scout in my own right; I signed (Brewer owner) Bill Veeck for the marines." Coast Guard (member) Spiegel is home at 2469 W. Lisbon on leave. Mrs. Zarder, 65, of 2412 N. 27th st is the Brewers' No. 1 fan. She says she has not missed a home game since 1926 and has always had the same seat, just at the right of the main entrance. The Baumes, who live at 2322 N. 29th st., had a warm spot in the sun. 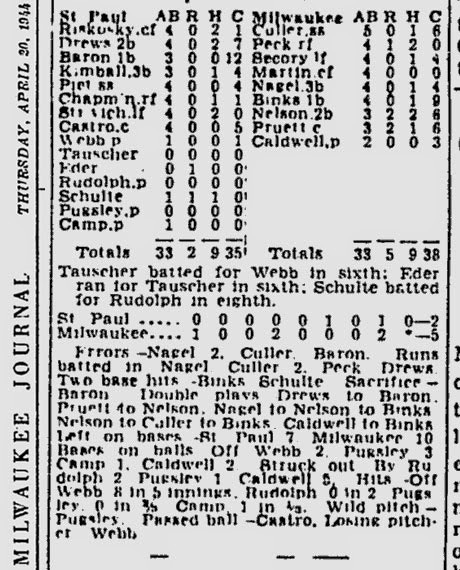 Not to be outdone, the Milwaukee Sentinel featured a look at a pivotal play in the fourth inning, as the Brewers extended the lead they held since the bottom of the first, a lead they never relinquished. We've taken an in-depth look at this photo before, but I'm still amazed at the numbers of fans standing on the warning along the outfield wall. Must have been very interesting if a batter managed to get one all the way to the wall, four hundred feet from home plate. Those fans crowded in the outfield saw a heck of a game. 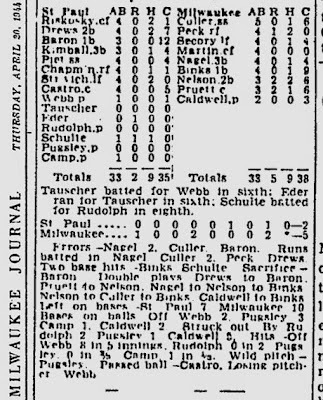 The Brewers scored early and often, defeating St. Paul 5-2. A great start to the 1944 campaign, as the Brewers set out to win their first back-to-back pennants since 1913/14. 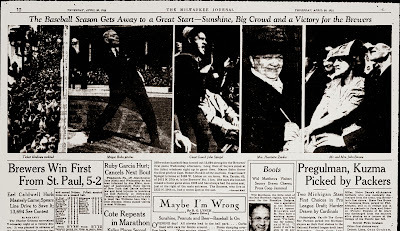 "Jolly Cholly's Tearoom: Act I, Scene 1"
Today in 1914 - Game Two! Today in 1914 - Opening Day! 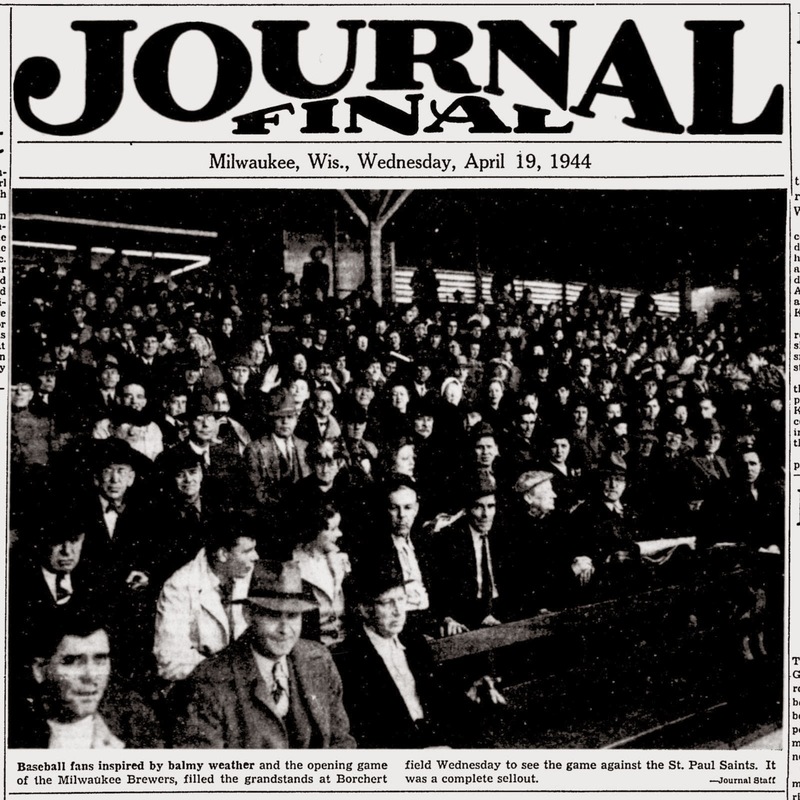 Back in 1944 - "Until a Better Man Comes Along"
Today in 1914 - Athletic Park "All Dressed Up"
Today in 1944 - "A Brewer Tradition"